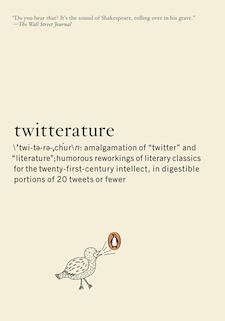 Twitter + Literature = Twitterature! Even though these two boys received a book deal out of this brilliant idea, what I’m really jealous of is their creation of a new word into the English lexicon; that is always a sign of a great writer (Thanks Edgar Allan Poe, for adding so much beautiful words to the English language!). Discrepancy: However, this seems to not be the first book that tweets classic literature. The Little Book of Twitter by Tim Collins was released July 15, 2009.
jdsalinger: Rich kid thinks everyone is fake except for his little sister. Has breakdown. Posted on January 26, 2010 by LN	This entry was posted in from the page to life's stage, twitter. Bookmark the permalink.